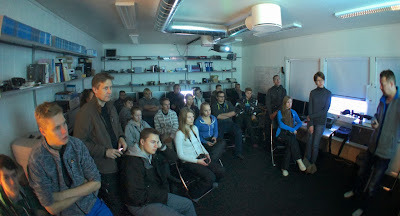 Professor Fred Sigernes opened the Wednesday morning at Kjell Henriksen Observatory, having a very complete lecture about aurora research. The Finnish high-school students of the Space Weather Science Camp, who completed their EISCAT Svalbard Radar experiment on Tuesday, got the chance to visit other science facilities in Longyearbyen. The photo above shows them at the Kjell Henriksen Observatory (KHO), which is an auroral or optical observatory providing domes for optical equipment to observe the skies. UNIS director Ole-Arve Misund showed us the slightly different student logistics department at UNIS, full gear for ever field trip on Svalbard. Also the Logistics Unit of UNIS was a point of interest. It may be unusual for a university to have a logistics unit, but it certainly is unusual to have this kind of logistics unit, which is entirely geared towards the arctic environment of short summers, long winters, snow, ice, glaciers, polar bears, etc.